DUBUQUE — For more than 20 years, Chuck Chalberg has performed as British writer and Catholic convert G.K. Chesterton for audiences across the country. 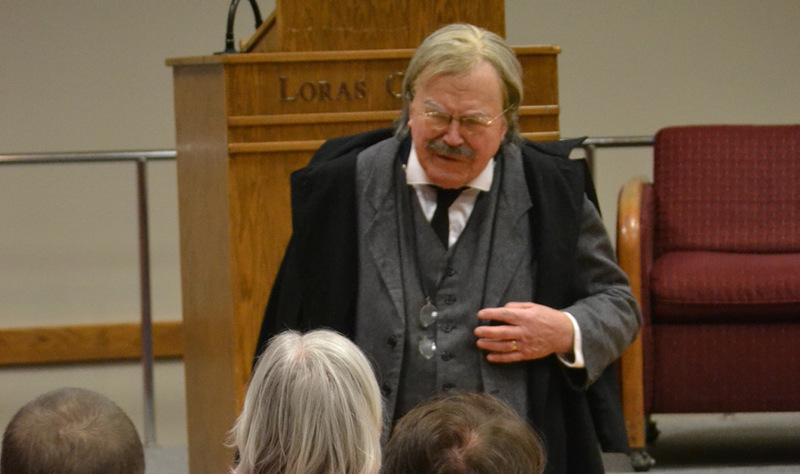 On March 19, Chalberg brought his one-man show based on the life and thought of Chesterton to Loras College in Dubuque. Chalberg, 75, of Bloomington, Minnesota, is a retired college history instructor who, through the years, has performed as a number of different historical figures, ranging from U.S. President Theodore Roosevelt to baseball player and sports executive Branch Rickey. But it’s for his impersonation of Chesterton that Chalberg is most well known, and for which he is most passionate. 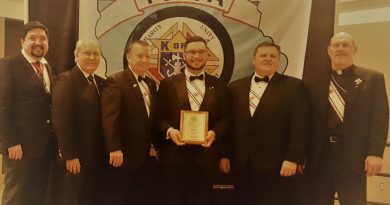 It wasn’t until he was in his late 30s that Chalberg became familiar with G.K. Chesterton, a man known for his great intellect and writings on religion, economics, social issues and a variety of other topics. “If you’re a reader, he’s quoted all over,” reflected Chalberg. “I finally decided, ‘I’ve got to find out who this guy is.’” So he started reading his works. Chalberg, who had already been doing historical impersonations as an extension of his teaching job at a Minnesota community college, eventually decided to add Chesterton to his repertoire. Chalberg does his Chesterton charac­terization at colleges and Catholic par­ish­­es about a dozen times a year. 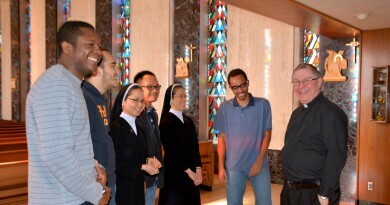 He can also be found on the Eternal Word Television Network (EWTN), which broadcasts Catholic-themed programming on TV. In character as Chesterton, Chalberg covers Catholic apologetics, as well as the topics of Chesterton’s family and background and his views on a variety of controversial topics of his day. The show also incorporates a good deal of humor. Chalberg goes to great lengths to achieve as much authenticity with his portrayal of Chesterton as possible. Chesterton lived in the late 19th and early 20th centuries, and when playing him, Chalberg dons a period costume complete with an inverness cape, slouch hat and swordstick. Chalberg also wears what he calls a “fat suit” to try to duplicate the physique of a man who was over 6 feet tall and was said to weigh in at more than 300 pounds. Chalberg said he has also worked hard to perfect Chesterton’s British accent. 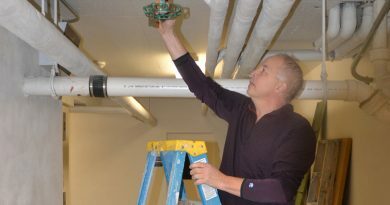 “I’ve had Brits tell me I’m OK … I think it’s passible,” said Chalberg, with a laugh. He said he finds his audiences receptive to his Chesterton impersonation and often discovers many of the people who attend his shows are already familiar with Chesterton’s writing, including a good number of young people. Though G.K. (which stands for Gilbert Keith) Chesterton has been dead for more than 80 years, Chalberg believes he still has a great deal to offer modern society. Not only are many of the issues he addressed still topics men and women wrestle with today, but Chalberg said much can be also learned by the manner in which Chesterton expressed his opinions, always respectfully, while not alienating those who disagreed with him. 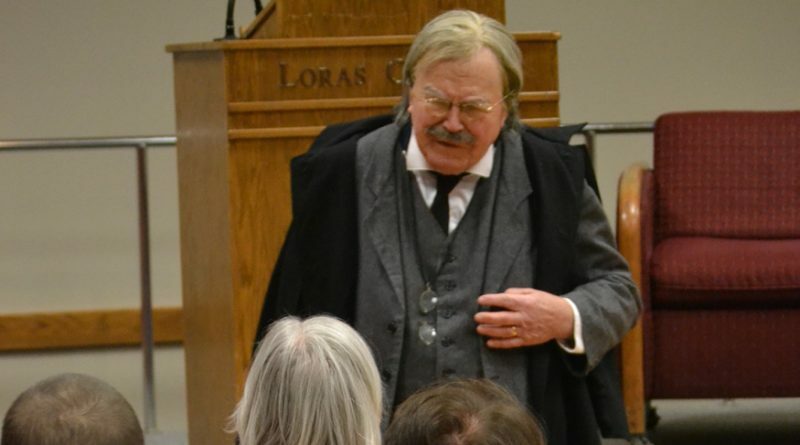 Chalberg’s March 19 performance as Chesterton was sponsored by the Archbishop Kucera Center at Loras College, the mission of which is to support Catholic intellectual and spiritual life at the college and in the Archdiocese of Dubuque.